Interested in living in Greece for a year, five years or forever? Anyone with citizenship from the 28 EU member states (except Croatia), Iceland, Liechtenstein, Norway or Switzerland has the right to live and work in Greece. 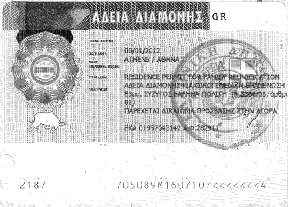 Non-EU citizens — without a spouse-child relationship to a Greek/EU citizen and without possibility to acquire dual citizenship with the EU — wishing to retire in Greece or otherwise live in Greece without working can apply for a Greek residence permit based on independent income or funds from outside the country via retirement benefits or a pension, virtual job, business, savings or grants. It is not a work permit. If this permit does not suit your situation, see “How non-EU citizens can get a visa and permit to live and work in Greece” to learn about other possible options in acquiring a residence and work permit. Please take the time to read this article, as it is unavailable anywhere else and constantly updated since October 2007. *Article last updated January 2, 2015. Outdated versions of this article appear on websites run by the U.S. Embassy in Athens, Greek/Russian/Cypriot/UK lawyers, property sales/rental companies and two commercial ‘expat’ guides that reused information without permission. They refuse to abide by copyright law and remove the infringing material or give credit, though many passages were copied verbatim, including first-hand details from my readers and my life. It used to be that those retiring or residing in Greece without working within the country’s borders could enter without a special visa and simply apply for a residence permit upon arrival. This is no longer true, and any friend, forum, article, lawyer, Greek consulate/embassy or authority in Greece saying otherwise is misinformed. It is also false that “no visa/permit is needed” and “no one will bother you.” This advice typically comes from Greek and other EU citizens who subscribe to decades-old myths or are ashamed to admit they don’t know the law, which applies to all non-EU citizens. Americans, Canadians and Australians do not enjoy special treatment. Look at ‘Comments’ and see a few who believed these lies and got in trouble. According to the Greek state’s legal council (Nomiko Symboulio tou Kratos), applicants must go to the Greek consulate/embassy in their homeland to secure a special visa, namely a national/Schengen type ‘D’ visa that denotes intention to immigrate. This would then be presented to the local office of your municipality in Greece upon arrival to secure a residence permit based on independent means. There is no such thing as a residence/residential/residency visa or retirement visa for Greece. The following will prepare you for collecting the correct documents and what you can expect during the process. It is not as simple as getting a visa and showing it to someone in Greece to get a permit. The government discussed the ‘possibility’ of granting residence permits to non-EU citizens who purchase a home worth 250,000 euros or more in November 2012. Before the new permit was created to encourage foreign investment, all non-EU homeowners had to show sufficient means to meet everyday expenses and support themselves without working if they wanted to live in Greece more than 90 days in a 180-day period. The visa and residence permit described in this article is based on that very premise. *I am prepared to publish an article, but I’m seeking someone with first-hand experience as official government circulars never match reality. — If you are immigrating as a family, they normally ask an additional 20 percent for a spouse (400 euros/month) and 15 percent (300 euros/month) for each unmarried, minor child. Now contact the Greek consulate/embassy nearest your current residence and see if you need an appointment. See “Greek Consulates/Embassies Worldwide” or look in your phone book to locate one. All candidates will be asked to appear in person. At the Greek consulate/embassy, staff will give you a visa application to complete and sign. Your documents will be reviewed, fees will be collected, and you (and your family, if applicable) will be interviewed. The Greek consular/embassy staff will keep your passports, then call to notify you if further documents are needed and if you’ve been approved. When/if your national/Schengen type ‘D’ visa is approved, you’ll be required to choose a definite date of departure and show proof of it (airline tickets, etc. ), so they can issue the visa with the correct expiration date. Your passports will then be returned with visas applied, which you can pick up in person or have priority mailed to you for a fee. Before departing for Greece, be sure that you look at the section “Documents needed” below and secure anything you may need. Requesting them after you’re in Greece will be costly, difficult and often extend beyond the time limit you have to apply for the residence permit. Children under 14 who accompany the applicant do not typically need special visas and can apply for a residence permit in Greece based on their parents’ status. However, you will need to bring an original long-form birth certificate for each child and any marriage/divorce certificates, and get an apostille for each document. See, “How to get an apostille” if you need help. You technically have up until the expiration of your visa to apply for this residence permit, but it is recommended you apply within 30 days of arrival in Greece. Why? a) Because documents you brought to Greece may exceed the period of validity if you wait too long, then they’ll need to be requested again from abroad, which takes time and may delay your application beyond your visa’s validity. b) Because the process takes time to work, and your visa may expire and leave you in an illegal status that can only be fixed by exiting Greece, applying for another visa in your homeland, and waiting up to 90 days for a new visa to re-enter and try again. This has cost people precious time and money; don’t let it happen to you. There have been cases when Greece denied residence/work permits to non-EU citizens — including spouses of Greek citizens — because they waited more than 30-60 days to apply, and it was only remedied by filing claims with an ombudsman and/or intervention by a fee-based lawyer. Your local “dimos” (municipal office) or nomarxeia (prefecture office) accepts applications for residence permits during certain hours, usually early in the morning starting at 7:30 a.m. There is no nationwide standard — some take appointments, some operate on a first-come, first-serve basis on specific days. — No translation is necessary if the passport has Latin letters. If not in Latin letters, it must be translated to Greek. See “Official translations to Greek” if you need assistance. — The municipality employee can do the certification of photocopies, no need to go to the police or embassy. — Original must be filled out in Greek, then photocopied once without a signature; both are signed when the municipality employee instructs as such. — If applying as a family, it only needs to be completed once. *I do not quote figures in other currencies because the exchange rate fluctuates daily. Any documents not in Greek must be first translated to Greek at the Translation Department or by a lawyer. Greece’s Translation Department requires that all documents/statements/certificates be originals with original signatures. Lawyers can translate e-statements from banks, Internet copies and non-originals within reason. Non-Greek documents may also be translated before arriving in Greece by approved persons, but the cost is almost always higher. If you are a family, you must apply at the same time, though not all members need to be present and children under 14 do not need special visas. *I make a copy of my entire file before handing it in because my papers have been inexplicably lost several times. However, this is a personal choice. After your papers are verified and accepted, you will be issued a bebaiosi (certificate of receipt; blue paper with photo). It is not a permit. It acknowledges papers have been received and you have temporary permission to stay past the validity of your visa, while higher authorities examine your documents. You must carry this bebaiosi with your passport for public and private transactions, as well as legal purposes should a policeman or other authority ask you to present it. Keep a photocopy in a safe place in case the original is lost. There is no interview or other requirement, but it is your responsibility to go in person to follow up on its status since no one will call or otherwise contact you except in rare instances. If your application is successful, a permit will be issued in the form of a sticker placed in your passport or you will be given a card. See “FAQ: Greek work and/or residence permits” for answers to commonly asked questions. The official permit is good for one year. Must be renewed at least 60 days in advance of the expiration date, and most of the same documents listed above will be necessary. *Hat tip to reader Robert for contributing this update. If this option doesn’t quite suit your situation, I recommend reading, “How Americans/non-EU citizens can move, live and work in Greece” to familiarize yourself with the most common Greek permits. What you wrote is true. Permanent residents with independent financial means – ie: 24,000 euros in a Greek bank account! I just found this out in July while renewing my residence permit…and they are a bit stricter re: health insurance, wanting proof of payment, and proof of coverage in Greece. You have a great website! I check it often, please keep up the good work! A – Thanks for adding your comment. What you said it being “stricter” is true with regards to depositing the money. However in the 13 years I’ve lived in Greece, they have always asked for proof of insurance coverage, et al. I appreciate your readership! I guess the guide of how to build your own figther plane has less steps. Why are things “here” (Greece) so complicated? It’s supposed that the government has to serve the people, not the opposite. Nowadays you adapt to what the government wants from you. It seems that you have to ask for a favour, when in fact they take the money from your taxes and they should be grateful. G – You’re lucky you’re an EU citizen. I waste a lot of my life doing bureaucracy, and it’s a never-ending cycle because by the time I get my permit, it’s time to start renewing it again. Very useful site! I hadn’t heard of it till a friend tipped me off today, but I’ll spread the word. The paperwork required for the economically independent residence permit is highly subjective. In my case, it took months of waiting followed by a couple of calls by a friendly politician. Me: Hi, Is my residence permit ready? Me: Is my residence permit ready? Them (rudely): You have to come in, we don’t give that info on the phone. Me: (In my deepest, politest Barry-White voice) Hello, I’m from the USA and I applied for a residence permit. Not that I’m worried but how long til it’s ready? Them: What’s your protocol number? Them: Oh, probably in 2 months. LESSON LEARNED: If you sound too much like a NEEDY immigrant and not a WHO CARES EXPAT, you get crapped on……. An American friend of mine has just fallen foul of his attempt to obtain this visa. He is just retired (pension of a schoolteacher) and came to Greece in June 2007 on a Tourist visa. He hoped to be able to apply for a Residence permit after his arrival here. But he was told he needed a special visa for retirees, available only abroad. After his 3 months expired he travelled on holiday to London. At Spata (Athens) airport he was told re-entry would be impossible. In London he enquired at the US Embassy for help. They advised him to return home to the States and then apply for the special visa from the Greek Consulate. This he did. He had help from Greek-speaking friends when he applied for the proper visa. However, to no avail. Almost 2 months later his visa application was refused (insufficient funds) and he is now told that no appeal is possible. What to do next? Any ideas? There is a transparency issue in Greece, which means new laws and directives can be implemented or changed at any time without properly spreading the word to the public, public sector offices and consulates. Firstly, he was denied re-entry to Greece because of the Schengen rule that says Americans (and other non-EU citizens part of the visa-waiver program) can only stay a maximum of 90 days within a 180-day period. Going to the UK or a non-Schengen country, then coming back changes nothing if he’s already stayed 90 days. Many countries do not enforce this rule, but Greece is one that does. Secondly, with regards to “insufficient funds” being the reason for denial, an appeal is not possible if he doesn’t have at least 2,000 euros (now approximately 3,000 USD with the current exchange rate) income per month as proof of financial support. This is a strict uncompromising requirement. If he has evidence to contradict that, one might get in contact with the Greek Consulate General in Washington DC and lodge a complaint. Otherwise, I’m afraid there are no other options I’m aware of. The U.S. Embassy is a diplomatic mission that offers services to citizens and non-citizens pertaining to the homeland, not the host country where it is a guest. Therefore, it does not intervene on issues pertaining to Greek laws and regulations, which is the reason they cannot help with Greek visas, residence/work permits for Greece or when an American citizen breaks the law. I’m sorry I don’t have any other options to offer your friend. Thank you very much for your reply. I am forwarding this information to the person concerned and hope it will be helpful to him. Keep up your good work on a brilliant site. Hi, Kat. I posted an inquiry on Just Landed (Greece) addressed to you before I found your website. This site is filled with wonderful information. It answered most of my questions, so if you happen to check the forum on Just Landed, please disregard it. To capsulize my posting on Just Landed: I just recently retired from the US military and decided to retire in Greece. I lived and was stationed in Greece for almost 4 years (Jan 2002 – Mar 2006). A week after my official retirement (Dec 6, 2007), I flew to Greece as a tourist without a Schengen visa because the Greek Embassy staffs (in DC and in LA) told me I didnt need one as an American, even after telling them my intention on retiring in Greece. 1) I went to Alpha Bank to open an account but I was told I couldnt open a bank account without AFM. Is it just Alpha Bank that requires that? You mentioned AFM is not required to open an account. 2) The Greek Embassy staff here in the US never mentioned SPECIAL ENTRY VISA, they did however mentioned TYPE D visa. Well, after my 90 days in Greece, I flew back to the US and am going to the Greek Consulate in LA next week. Am worried that if I asked for SPECIAL ENTRY VISA that nobody would know what I was talking about. Is there a GREEK NAME or TERM for that? On a good note, the guy who was working at the Peristeri Office in Athens was very helpful and was more than willing and happy to help an American (he said he never had an American applicant ever before, and made me cut the line and invited to his office). He even filled out the application form, but when he called the Ministry for guidance, the Ministry of Internal Affairs (?) asked about the visa from the Greek Embassy in the US. That’s when I hit a brick wall. 3). My military pension is roughly (at current euro rate) 1200 euros. Could the difference of 800 euros be covered by my bank savings, mutual funds/TSP accounts? Thank you very much in advance, and again job well done on your site. Hi Deli, nice to see you here and thank you for your kind words. I’m glad you found me because I unfortunately do not have time to check message boards that often. For me, it makes more sense to invest time in my own site instead of giving away information that helps another site. 1) Needing an AFM to open a bank account – The banks at which I have accounts did not ask me for an AFM or a residence permit; all they asked for is my passport. These days, most Greek banks do ask for an AFM for security reasons. I do not have an account at Alpha, so I cannot say if this is a country-wide policy or if this is specific to the branch or the person helping you. As you know, results vary a lot here. 2) Special entry visa – I’m told that the proper visa is a Greek national visa type ‘D,’ which denotes the intention to immigrate. The article has been updated accordingly. 3) 2,000 euros per/mo — I’ve heard of two situations. One is you are asked to deposit 24,000 euros up front in a Greek bank account for the whole year. The other is that you must show proof of 2,000/mo income; it doesn’t matter how that’s done — savings, pension, alimony, profits from a company abroad, etc. I am glad that I found your website and had access to the information/guidance you have on it. You have no idea how many questions I had/have that your site answered. Its a huge welcome relief amidst the uncertainties and flaws of the Greek immigration laws. ..and did you mention patience? Ela re..I lived in and survived Greece for 4 years (so what does that tell you?) 🙂 It’s funny because in Larissa where I was stationed, the locals called me the most greekified American. Yes..i drove and cursed like one! Anyway, again thank you very much. Wow, after reading all the articles above I will start doing some research myself. Boy, I hope you can help me!! My husband & I came to a small island in Greece last August after selling everything we had back in the states. Before leaving, I personally visited and phoned the Greek Consulate in my area. I explained we were planing to relocate in Greece. We have proof of self support and health insurance and passports. We intended to go to Greece to be with our grandson. we were told that we had a “good enough” reason for staying. We were under the impression once we arrived in Greece and found ourselves a place within the 90 days. We could then apply at the local police station for residency/extended stay permit. We bought one way tickets and off we went. Going through customs when asked how long we planned to stay we stated we hoped for good. No further questions were asked and we went on our way. Once we arrived, found an apartment and spent time with our grandson. It didn’t take long for us to decide this is where we want to stay. As our 90 day visitation time was getting close, we went to the local police station as instructed to apply for an extended stay. We were told that the police station no longer handles that process and told us to go to the town hall. That’s when the nightmare began. The man there was not pleasant and with our Greek speaking daughter asked why should we be allowed to stay? We need proof of being self supportive. What would happen if he was to go to America? Would they just let him stay? With no income?…. Bite my tongue, but wanted to say, Yes we would. We’d pay your rent, feed your family, school your children and provide free medical care, it’s called welfare! However, I didn’t. We explained the situation and he changed his attitude a bit. However, then wanted to know were did we get the forms we had filled out? (from the Greek Consulate’s office in the states) He felt they were not the proper forms. He told us he would have to get the proper forms from Athens. We should return the following day to pck them up. to begin with, so we could not stay in Greece. Needless to say we were speechless. We contacted the American Embassy in Athens only to be told it’s true, we should have gotten our Visas FIRST. In the meantime, we were witnesses to a serious crime. Where the detectives asked if we could stay for a couple -3 months in case we were needed to testify. We naturally agreed do to the degree of the crime. Since then, we have not heard back from the authorities about the case. I have attempted to contact more information from the American and Greek Consulates, the U.S. Citizens Traveling Abroad at the governments web site, various governmental departments at all levels. Even requested information as to why I was so misinformed at the same Greek Consulate’s office where I first inquired before leaving the U.S. And, recently mailed a letter to both Embassies in two U.S. cities ( one being Washington D.C…. I have not received a single word from any resources I’ve tried. Including website legal advice forums! I’m about to go insane. Everyone on this island tell us not to worry, no one cares as long as we stay out of trouble, we’ll be fine. I am not comfortable with being an illegal alien! I have discovered that apparently Greece is in the process of re-organizing their immigration/alien system. In the meantime it seems no one knows or even cares were we need to go or who it is we need to see. Under the circumstances, we feel we should be allowed to be reconsidered and allowed to at least apply for a residency permit. We fear after all this time and the strong re-bonding we’ve experienced with our grand son. What effect would all this have on him? What is he to think of the Greek government sending us away? We also wonder what happens when we decide to return to the states to visit and /or attend weddings etc.? What resource would you recommend? Is there any hope for us? I would appreciate any and all possible suggestions you my lend. Hi Dee – The information I’m going to give you comes from written documentation from the municipality and my own experience with the type of residence permit you are trying to get. There are exceptions (this is Greece, after all), but I like to give it straight, and then if someone enjoys leniency, so be it. 1) Non-EU citizens, regardless of nationality or family connection to a Greek/EU citizen, have always needed a residence permit to stay beyond the validity of their visa. How do I know that? That is the case in all EU countries. It’s the law. The first time I came here 11 years ago, I knew I needed a permit (I never consulted the Consulate, I went direct to authorities), but my boss didn’t give me the contract I needed to file on time, so I was fined for overstaying my visa when I left. You also will be fined when/if you leave Greece because you are beyond the 90 days. 2) What the Consulate General told you about getting a visa extension is false. A visa extension is for temporary visitors and granted under special extenuating circumstances. Further, the extension (if granted) only lasts a maximum of 6 months (extremely rare case); most extensions last only 3 months. If you told them that you’d intended to live here permanently, they should have immediately directed you to a type ‘D’ visa, which is a visa that specifically denotes the intention to immigrate, or at least told you that you needed a permit. 3) The type D visa has not always existed, but the Consulate is lying about reorganizing their immigration/alien system. The major overhaul in immigration occurred in December 2005, with only minor amendments in December 2007, so it’s more likely that they’re taking the typical 2-3 years to get up to speed. I first heard of this visa being required for this particular permit in March 2007, so it took more than a year for municipalities in Greece to be informed and it sounds like some Consulate/Embassies are still not informed. 4) It used to be that you could come here without the type D visa and apply for a residence permit based on independent means when you got here. That’s how I got mine 10 years ago. BUT, it has always been true that you need to show proof of insurance coverage, proof of income, proof of residence in Greece (lease, mortgage, etc.). Back then, they did not ask me to deposit the whole 24,000 euros into a bank account like they do now, but they asked to see a bank account of a few thousand dollars with photocopies of my passbook certified by police, along with check stubs from income I received from outside Greece. Therefore, this is not a new requirement. It has always been so. 5) In smaller towns, the police handle permits and visa extensions. In larger towns, the ‘dimos’ or town hall handles permits for Greece, and the police station handles visa extensions. 6) It is best to not rely on Greek and EU citizens for information and advice about permits and visas. Why? Although I knew a few good people who are really excellent sources, the majority dispense information based on hearsay/rumors and don’t have first-hand experience or knowledge about actually doing the paperwork and aren’t familiar with laws because they don’t pertain to them. This is also why the most popular English-language weekly is often wrong — I know this because I used to rely on them for information, and it’s been wrong for the past 10 years; something is always missing, and it’s because they’re writers are Greek and have no real first-hand experience with bureaucracy. People have a hard time saying, “I don’t know” here, so they make up an answer or say “don’t worry.” That’s never been good enough for me, and it shouldn’t be good enough for you either. I started this website in an attempt to help people avoid these things. 7) The “don’t worry” advice comes from yesteryears of non-enforcement of the law and people flouting or skirting it somehow. But it doesn’t mean laws don’t exist and don’t apply. 8 ) Unless you have an inside connection in Greece who can fix this for you (politician, connected lawyer, employee at the Foreign Ministry), there is no point contacting the Consulate or Embassy or anyone outside Greece because the damage is done and cannot be fixed because your visa is now expired, and you are in an illegal status. That’s why no one is responding to you. Well, that, and the fact no one wants to take responsibility for their incompetence; they figure it’s your problem now. 10) If a Greek wanted to immigrate to the USA, he also would need to show that he or someone in the USA has funds to sponsor and support him. i.e. If my Greek fiance and I wished to go to the USA, I have to go ahead of him, establish a domicile, get a stable job, sign a 10-year binding agreement to support him unconditionally (even in divorce), and only then would he be allowed to come over and get a permit. The minimum funds required by the USA is half what Greece demands, but I wanted to illustrate that the USA would not take care of him, just as GR would not take care of us. The only legal way he’d be able to get around the immigration process to the USA is to have dual citizenship with the USA, just as you having dual citizenship with Greece or another EU country would be the only way for you to get around the permit. A Greek could come over on a tourist visa and overstay, but being in an illegal resident status would not entitle him to welfare benefits. a) Keep staying here without a permit and stay under the radar. This is easy to do if you live on an island and won’t be engaging in anything legal (or illegal), such as getting an AFM (tax number), buying a car/home, taking part-time work, etc. However, the drawback is you will you be fined 600-1300 euros for overstaying your visa when you leave Greece IF border control decides to punish you (they may not); as long as you pay the fine, you will not be blacklisted and can come back to Greece. b) In order to get the permit done the right way, you must leave Greece, go to the Greek Consulate/Embassy in the USA and apply for the type D visa, give them all the documents they require (listed above), re-enter Greece with the visa and apply for the permit, which must be renewed every year. You must also stay away from the Schengen zone (of which Greece is a part) for a minimum of 180 days because non-EU citizens are only allowed to stay a maximum of 90 days in any 180-day period. That’s not what you wanted to hear, but these are your only two options should you not have connections to help you. Even if the Consulate were forced to admit their mistake, I don’t see a way to force them to call authorities in Greece and have your permit issued because they’d have to call local authorities in your area, then the Perifeira, then the Foreign Ministry. That’s an awful lot of force at different levels. Ms. Dee: I feel your pain. I experienced, first hand, the same ignorance and incompetence you went through with the Greek Embassy/Consulates staff here in the US prior to flying to Greece in December. Essentially, they all told me: “No visa needed, just fly to Greece and apply when you get there. It would be stupid of the Greek government to not approve you since you won’t be sponging off from them or stealing somebody else’s job.” So, I flew to Greece and when I applied for the permit, the first thing they asked was the Visa! My Greek friends told me the same thing your friends told you, to not worry and just stay as long as I want as long as I stay out of trouble. I don’t think so! Suffice to say, I left and flew back to the US. I’m not giving up though, I’ll let you know what happens with my meeting with the consulate staff. Good luck and take care. Kat, just discovered your site today and have to tell you how great it is. I want to share a little on this issue; my wife and I moved here three years ago from California and have had very little trouble renewing our permit the first two times. This past September we went through the process again as before, however, here it is 8 months later and we’re bogged down in the typical Greek bureaucracy, lost paperwork, holidays, vacations, and other assorted delays. We have never in three years been asked to deposit funds in a Greek bank and our copies of U.S. bank accounts, stocks, etc. have always sufficed for previous renewals. This time our financial records are not being accepted because they come off the dreaded and mysterious internet. They must be “certified” originals AND translated. We had our bank and stock companies send us ‘originals’ but we’re being told they “don’t look like originals” and “they’re not stamped as being official”. We’ve decided we need to find a lawyer who might be able to intercede for us so we can get this finished before it’s time to renew again this coming September. Thanks for a great site. I wish all my fellow American friends good luck with their problems. As I promised on my last post, I would like to share what happened at the Greek Consulate yesterday (May 7) on my first attempt to get a special entry visa. The lady who helped me was very nice and helpful. I told her what my intentions were and what I went through, and she did acknowledge the fact that greeks would rather give bogus info than saying “Sorry, I don’t know the answer or don’t have the information you needed”. How true!!! Anyway, she asked 7 things from me. 7) $US 56.00 processing fee. I gave her more than what she actually asked. I also showed her my statements from my TSP and Fidelity accounts, and Statmenet of Service and Income from the Department of the Navy, translated to greek by the Hellenic Ministry of Foreign Affairs in Athens. However, I wasn’t able to file my application because most of my documents were dated 2007. I have to get a new statement from TRICARE for my medical coverage even if the 2007 statement clearly stated I have “continuous medical coverage as a retired US military member effective 1 December 2007′, and a 2008 FBI clearance. I thought, well..it’s OK. I figured she asking me 2008 clearances and statements were valid. So, I mailed all the necessary requests and fingerprint card to FBI and TRICARE today, which would normally take at least 4 weeks for the results/response (which means, my plan on flying back to Greece as early as June 6 is temporarily shelved). The only thing was that she didn’t really buy and consider my TSP and mutual funds statements. Although I have enough savings in my bank account plus my retirement pay to cover the minimum 2000 euros a month requirement, she insinuated that it would be better if I withdrew some of my TSP and convert some of my mutual funds/stock balances, and deposit them in my bank accounts and present them the next time I saw her. I thought and rationalized, maybe they require a more easily accessible cash on hand. She signed my application noting that she already interviewed me and told me to come back and see her with the new 2008 FBI clearance and TRICARE statements. The whole interview took no more than an hour, and though I wasn’t able to put my request in, at least there’s some kind of progress here as opposed to the kind of treatment and information I got in 2006/2007 from the Greek Embassy in DC and consulates in Los Angeles and San Francisco. I am hoping I would get the same results and treatment when I return in a month and the lady consulate staff would still be working there. To Alan: I had the same experience with the Ministry of Foreign Affairs (Translation Services) in February 2008. I brought some documents for translation and they didn’t accept my internet account statements because they were not the originals or didn’t seem to look like original copies. I’m just wondering, where did you guys renew your first and second permits? To Kat: You are in my prayers. I read your email today. I have nothing but high mega praises for you, not only for the work you’ve done and doing on this site and the hundreds of people you’ve helped and are still helping, but also for what you’ve been and going through as an American living and surviving in Greece. Thank you very very much. Me and my husband are working as software engg in greece since august last year on a 90 days work permit which was issued from India.Then we applied for residence permit. We have a valid work/residence permit which is valid from 15/11/2007 to 4/09/2008 . We have applied for the renewal but no one is sure when we will get the permit renewed. We wanted to go on a vacation in september outside greece.,but our visa expires on 4th Sept and we just have the blue papers. In the article above i read that we can go on blue papers as we had a residence permit . But,none of the people in the company are responding right. Whom shall i consult taking my papers? We need to make bookings but are unable as we dont know the exact status then. Can someone please help me know whether its valid to travel for us? Note from Kat: Please see “Summer travel period for non-EU citizens” (no longer applicable). Have a nice trip! Please help me. I am living in India and I have been cheated by my husband now living in Greece. We got married in 2006 in India, and after 15 days he left and kept telling me he will bring me over, but when he came home after one year he took money from my father for my visa. That stuck in our mind. We spoke to some people and learned that he is married to a girl in Greece and when I talk with him he is abusive and ask me for a divorce. I want to tell you he went illegally to Greece, and I want justice. What should I do and where should I file a complaint against him? The fact is, it is legally impossible for him to secure your visa or bring you to Greece after one year because he (a non-EU citizen) must legally hold a permit for 2 years, file taxes and prove an income of more than 10,000 euros to bring you over. You could have found this information on my website or by calling the Greek Consulate/Embassy in India, and known very quickly he was lying and never given him money in 2007. The only way to “get him in trouble” is to come here and file a report with Greek police. However, they have more pressing issues and will likely do nothing. Getting justice and getting revenge are very different things, and it’s often better to get out of a bad situation, start over and move on by investing time, money and good energy into good things and good people. We had a lawyer from when we bought the house and he helped us secure a visa – but only for a year and for $500. each. Still it was an important year as it tided my husband over to finally become an EU citizen. As you say, laws change, but though there were EU regulations that existed, it took a long time to implement in Greece. Finally our second line of inquiry paid off and my husbands Irish dual citizenship and passport came through so -yay! he was legal! However in spite of a marriage of 40 years- I was NOT legal. Again the frustrating conversations with the Greek Embassy. But now I was married to an EU citizen and as the spouse had legal “rights”. So, I submitted ALL the forms demanded and still was continually “rejected” because of a paper missing or an apostille needed or a name “error”… [my birth certificate had a hyphen between my first and middle name, my marriage license and passport did not- therefore I was obviously not the same person, and needed to swear a change of name or AKA…] and all over a period of 3 years, every six months. Finally I too qualified for Irish dual nationality. I applied and three months later I had my Irish nationality. Two months after that I had my Irish passport. We now both have residency permits that took a week to get. No problem. We even went to the head of the line, as EU citizens are given preference. Not fair at all, but welcome after the ten year battle! There are a few inconsistencies I’d like to clear up for anyone reading your comment. – First, there is no such thing as a permanent visa from anywhere for anyone. A visa is for entering a country, staying temporarily for up to 90 days and exiting. – Second, personnel at Greek Consulates and Embassies are notoriously unhelpful and uninformed about laws and practices. Not all, but many. But the income requirement and deposit were never lawfully that high. – Third, crossings to non-EU, non-Schengen countries and overnight stays to fudge another 90 days ended in 1999 when Greece entered Schengen. Schengen states that only a maximum of 90 days stay is lawful in any 180-day period in the entire Schengen zone. Anyone who thinks they renewed their visa after 1999 is fooling themselves or got away with it because of ignorance on the part of public sector/border control. But technically, nothing was accomplished. – Fourth, in many articles I say that the EU has laws that Greece refuses or is slow to implement. This has been true for as long as GR has been in the EU. – Fifth, there is no such thing as a one-year visa. A one-year permit, yes. And it costs 150 euro each. The lawyer took advantage of you. – Sixth, the non-EU spouse of an EU citizen has rights on par with an EU resident only in theory in Greece. In practice, non-EU spouses of EU/Greek citizens hold a lower standing than non-EU spouses of EU citizens living in countries other than Greece. – Last, non-Greek EU citizens technically do not need residence permits. As of 2008, they are required to get resident certificates that require very few papers and never need to be renewed. So yes, they are easy to get. I appreciate you stopping by and taking the time to share your experience.